Mumbai Metro One, which operates the 11.4 km Versova – Andheri – Ghatkopar corridor has cut the discount offered on Return Journey Tickets, Store Value Passes and 30-Day Trip Based Passes with immediate effect, a famous Newspaper reported. The slab structure of all three categories also stand revised from Monday i.e 12.06.2017. The revision in fares has come without prior intimation, taking commuters by surprise. Slabs of single journey tickets, on the other hand, are unchanged at Rs.10, Rs.20 Rs.30 and Rs.40. The cheapest way to travel by the metro is to purchase a 45 trip pass with a 30 day validity. Trip based passes were earlier available in two slabs – Rs.675 for 5 Km and Rs.900 for beyond 5 km. Now, they come in three slabs – 0 to 5 km, 5 to 8 km and beyond 8 km- at Rs.750, Rs.1050 and Rs.1350, respectively. In short Minimum is Rs.750 for 5 km, Rs.1050 for 5 to 8 km and Rs.1350 for beyond 8 km. The hike works out to 11% for upto 5 km, 16% for 5 to 8 km and 50% beyond 8 km. Versova – Ghatkopar trip based passes, for instance, will now be sold for Rs.1350 against Rs.900 earlier. There has been a reduction in the discount for return journey tickets, too. The earlier fare of Rs 30 is Rs 35 now, Rs 50 has increase to Rs.55, and Rs.60 to Rs.70. Store value passes have seen a minor hike as the fare slab of Rs.32 now stands revised at Rs.35. No change in other fare slabs in this product. Mumbai Metro official said, “We have only tweaked the discount. There has been no change in the fare structure. We have brought the discounts in line with the prevalent practice in other metros. There is no change in the fares of Mumbai Metro one. Top routes, Trip – based and Return Journey Ticket are following. The most awaited Mumbai Metro Services launched at 10 : 16 AM 8-June- 2014. The inauguration took place with much uncertainty as Mr Chavan had threatened to boycott it the day before, protesting against Reliance Infrastructure’s decision to unilaterally increase fares. However, he ended up taking the very first metro – decorated with flowers – with much fanfare along with Reliance Chairman Anil Ambani and Tina Ambani. 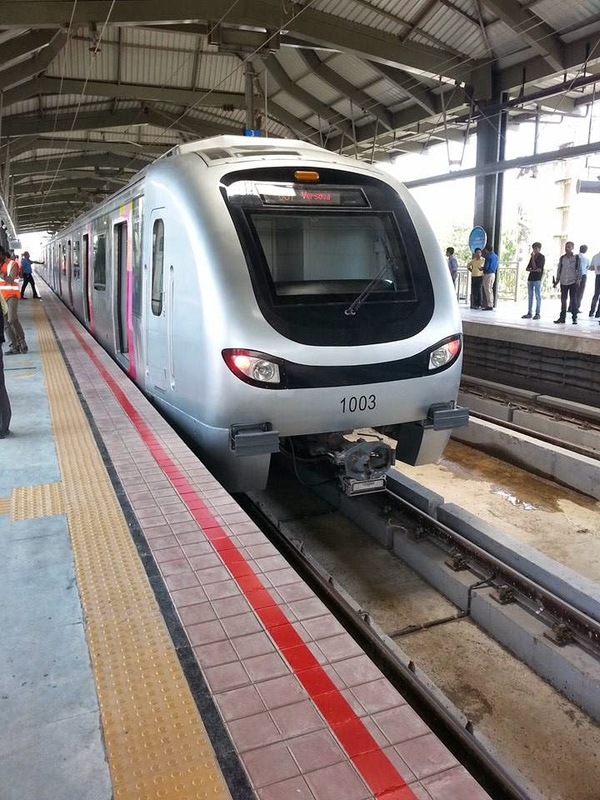 Mumbai is the fourth city in the country to have metro rail operations, besides Kolkata, Delhi and Bangalore. The new mode of transport is expected to provide the much-needed relief to the commuters in the bustling metropolis where the overburdened suburban railways ferries 70 lakh people every day. 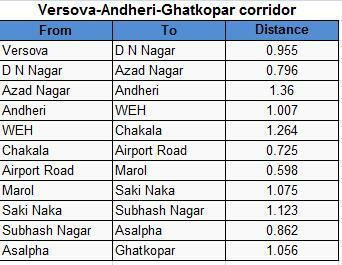 The 11.40 km long corridor Versova-Andheri-Ghakopar is likely to cut travel time by an hour. It takes 21 minutes to go from one end of the western suburb to the other. New fare structure will be applicable up to July 31 – 2014. Part of the promotion of Metro, for travelling passengers have to pay only Flat 10/- , as per the decision this fare is only for the starting month of the Metro. The commercial operations on the metro line expected to be introduce by November 2012. Mumbai Metro Rail construction is scheduled under three phases and expected the completion in 2021. Total length of Mumbai Metro rail is 146.5 km including underground rail of 32 km. 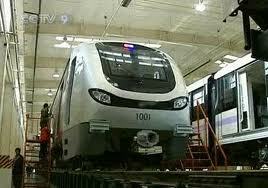 The expected cost of Mumbai Metro rail construction is 36,000Cr Indian Rupees. Inagurated by Dr.Manmohan Singh in June 2006 and work started in February 2008. It is a three line high capacity rail spanning 63 km.